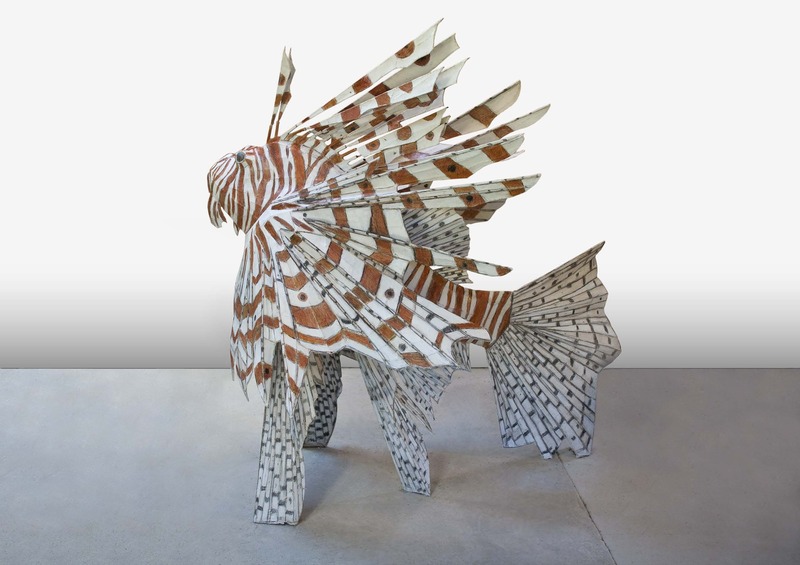 Fascinated by the anatomy and movement of living creatures, Kitty Wales creates sculpture and installation art based on her direct observations of animals. She has traveled to the Scottish Hebrides to study wild goats, the Spanish Pyrenees to observe bearded vultures, and the Caribbean to document reef sharks in their underwater habitat. As part of a collaboration between the Lyman Allyn Art Museum and the Mystic Aquarium, Wales visited the Aquarium to observe their collection of marine life, taking photographs and preparing sketches that would later fuel her creations in the studio. 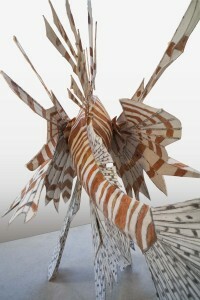 Inspired by the textural, feathery forms of the lionfish, Wales then set to work envisioning a site-specific installation intended for the Lyman Allyn. 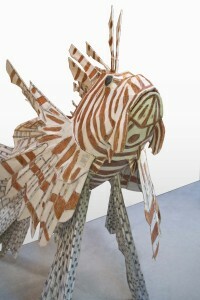 Three larger-than-life lionfish sculptures constructed of welded steel, heavy paper, and recycled pencils will transform the gallery into a “deep-sea” environment for visitors of all ages. Based in Massachusetts, Kitty Wales has worked on many site-specific installations at museums throughout New England and elsewhere, including DeCordova Sculpture Park and Museum, Lincoln, MA; the Fuller Craft Museum, Brockton, MA; the Currier Museum of Art, Manchester, NH; and the Fort Lauderdale Museum, FL. 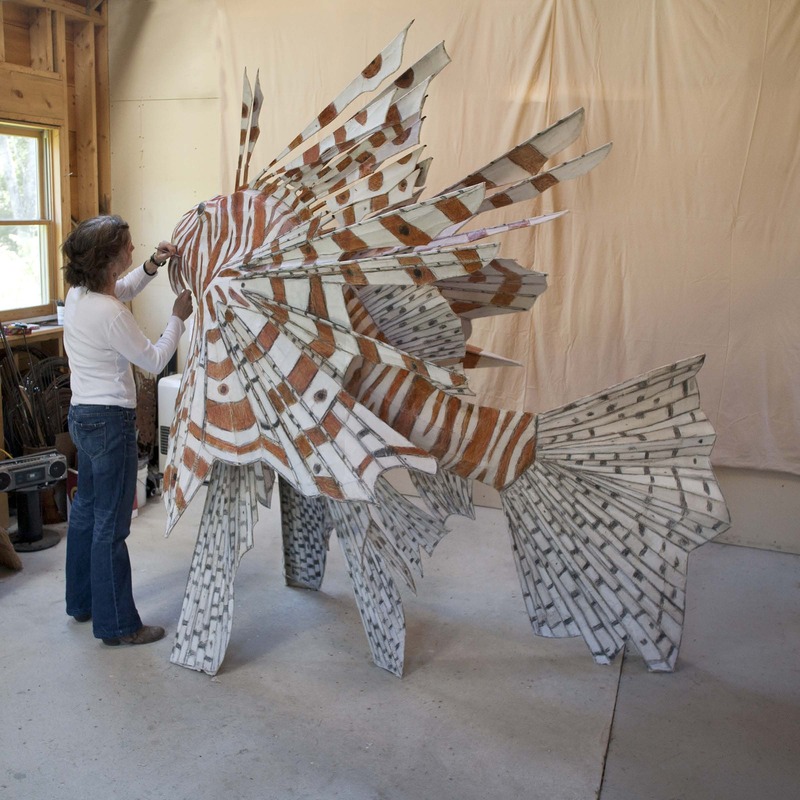 Kitty Wales, Lionfish: 2013, h 92 inches x L 107 inches x w 66 inches, steel, paper, mixed media Photo credit: Kathryn Osgood, 2013.